The most annoying thing on the Internet is to enter the user id and password repeatedly to login to your account. Well now you can save passwords in Browsers and do not have to type all that. If you use Facebook everyday, it is obvious that there will be login-logout everyday. Now imagine if you have to click on Profile Photo to log in to your Facebook account, is that possible? Yes possible, as soon as you click on your profile picture, you will login. You do not need to type the login id & password repeatedly. 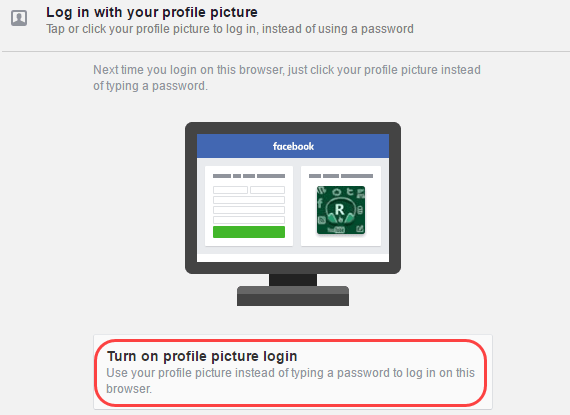 Today I will tell you about this latest facebook feature which enable you to login with your profile picture without entering user id and password. Facebook is giant social media platform with full of many exciting feature that you really don’t know. So let’s see how you can login by clicking on your profile picture on Facebook. First of all, you have to enable login with Profile picture in facebook account. Now in Settings, you have to click on Security and Login. In Security and Login, you can see the option log in with your profile picture, you have to click on Edit. Now click on the Turn on Profile Picture Login. That’s it, now you can see that the profile photo login feature is enabled for you. You can see the on signal. To test this feature, logout from your facebook account. Here you can see your profile pic, just click on it and you will be logged in. If you are thinking that by doing this, anybody can login by clicking on my profile picture then you are wrong. As soon as you clear your browser’s cache / cookies, then you have to enter the username and password to log in. The Login With profile feature will only work unless you clear cache / cookies. This feature is very helpful for those people who 24/7 login / logout on facebook. My profile picture login is gone after the last east update. How do I get it back. My setting for it is turned but says I’m not using at this time. How do I get it back? Kindly clear your browser cache and try again.